When I woke up (around dinner time), I craved noodles. I had quite a bit of energy after sleeping all day, so instead of warming a can of soup, I decided to try this Sesame Chicken and Noodles dish. It hit the spot. Next time I make it, I think I’ll hit it with a little bit of Sriracha too. Make it Vegetarian: Use vegetable broth and skip the chicken. 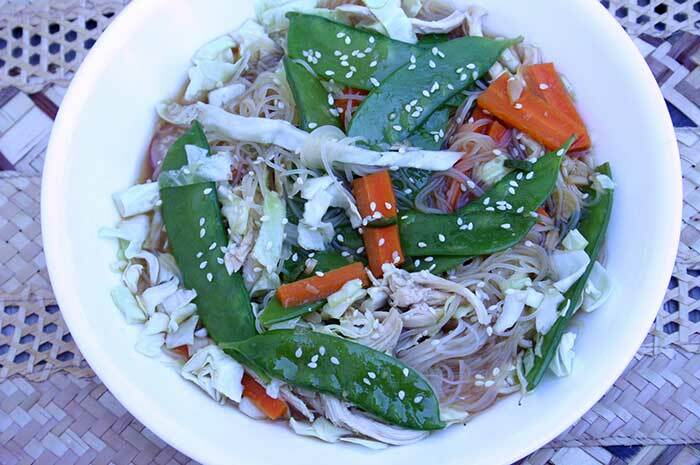 Make it Gluten-free: Use GF rice noodles or rice sticks, GF chicken broth and GF soy sauce. Cook rice sticks according to package directions. Drain and set aside. Heat vegetable oil in a wok over medium-high heat. Add ginger and garlic; cook 30 seconds. Add snow peas, carrots, radishes and chile pepper; cook about 2 minutes. Add broth to wok. Bring to a boil, then reduce heat. Simmer about 4 minutes. Add sesame oil, orange juice and tamari/soy sauce. Divide noodles among four bowls. Add cabbage and chicken, then ladle broth on top. Sprinkle with sesame seeds. Looks so delicious, sesame is my favorite. Hope you are feeling better.